March 11 at 3 p.m.
Dayton Opera offers an extraordinary opportunity to hear the international opera star Marcello Giordani in recital on Sunday, March 11. Hailed by Opera News in its March 2008 issue as “the greatest leading tenor of his generation,” Mr. Giordani maintains a heroic schedule of engagements at the world’s top opera houses. He comes to Dayton following a series of acclaimed performances at Lyric Opera of Chicago in Aida and at the Met in Madame Butterfly (photo above) and Ernani. His Ohio appearance will take place at Dayton’s acclaimed Schuster Center, built in 2003 and renowned for its acoustics and patron amenities. Mr. Giordani will be joined by soprano Melissa Zapin and pianist Katherine Olsen. Cincinnati Opera is pleased to share with you a special offer from our friends at Dayton Opera: a 20% discount on tickets. Regular prices $36-$92. Buying is easy! Purchase online at www.daytonopera.org or call(888) 228-3630. Use the code “Music Hall” for your discount. Sunday, March 11 at 3 p.m. Call (888) 228-3630 or visit www.daytonopera.org. A Rich Possession, to MA.com‘s home page. Mr. Conlon — music director of the Los Angeles Opera, the Ravinia Festival, and the Cincinnati May Festival — will address some of the complex issues facing classical music in the 21st century, particularly as they relate to future generations. In his inaugural post, A Peculiarly American Paradox, Conlon writes,”Probably no other country can boast as many great symphony orchestras, opera companies and conservatories. We are training and producing a stunningly high level of young musicians. The paradox: every arts institution I know is struggling to keep and develop its audience. With A Rich Possession, Conlon joins MusicalAmerica.com‘s list of insightful bloggers, including Sedgwick Clark (Why I Left Muncie), Alan Gilbert (Curiously Random), Rachel Straus (The Torn Tutu), James Jorden (Rough and Regie), and Eugenia Zukerman (Verbier Blog). Founded as a weekly newspaper in 1898, Musical America through the years has appeared in a variety of formats. Today, it is both the International Directory of the Performing Arts and MusicalAmerica.com. Returning to Musical America‘s newspaper roots, MusicalAmerica.com was launched in December 1998 and now publishes up to six performing arts news stories daily, by national and international correspondents around the globe. Most of the Directory listings are also available at MusicalAmerica.com. 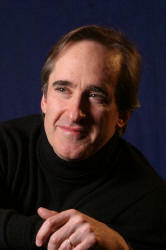 One of today’s leading conductors, James Conlon has cultivated a vast symphonic, operatic, and choral repertoire, and developed enduring relationships with many of the world’s most prestigious symphony orchestras and opera houses. He has conducted in virtually every North American and European music capital, and has been a frequent guest conductor at the Metropolitan Opera for over 30 years. Mr. Conlon is renowned for his efforts in championing the works of composers who were suppressed by the Nazi regime. For more information please email info@musicalamerica.com. CCM Opera is proud to announce Ian Ramierz (MM, tenor) placed 3rd in the Scholarship Division at the National Opera Association Voice Competition on January 7th in Memphis, TN. Ian competed with eight other finalists from around the country and was chosen to receive the Constance Eberhardt Memorial Award. The Opera Fusion: New Works performance venue has been moved from Werner Recital Hall to Patricia Corbett Theater. The DEADLINE for the Twenty-second Annual S. Livingston Mather Scholarship Competition for Male Voice Students is October 21st. Gentlemen, the competition is relatively close, you need to submit audio files AND it is open to full-time & part-time undergraduates and graduates. The finals are November 13th in Cleveland. This is an opera blog from my friend Fred Plotkin. Please visit! 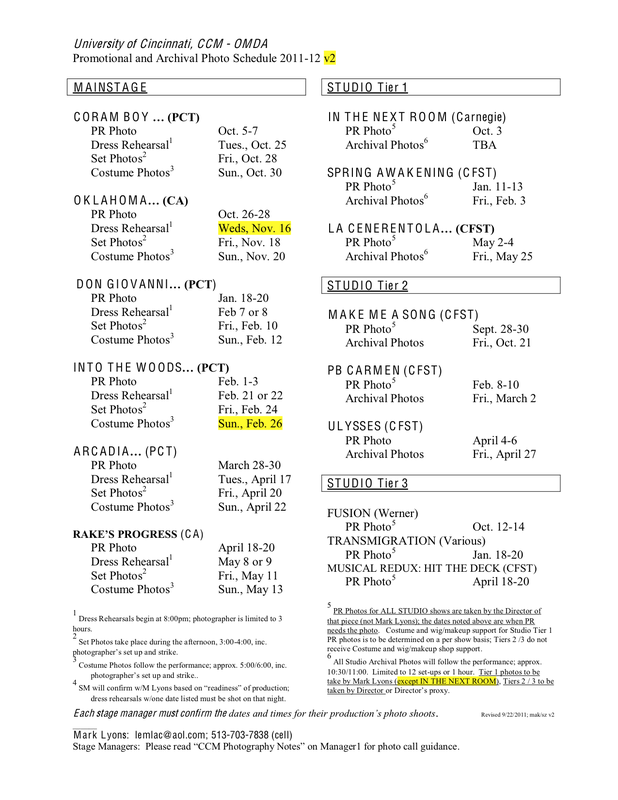 Please see the links below for the Promotional & Archival Photo Schedule for the entire 2011-12 CCM production season.